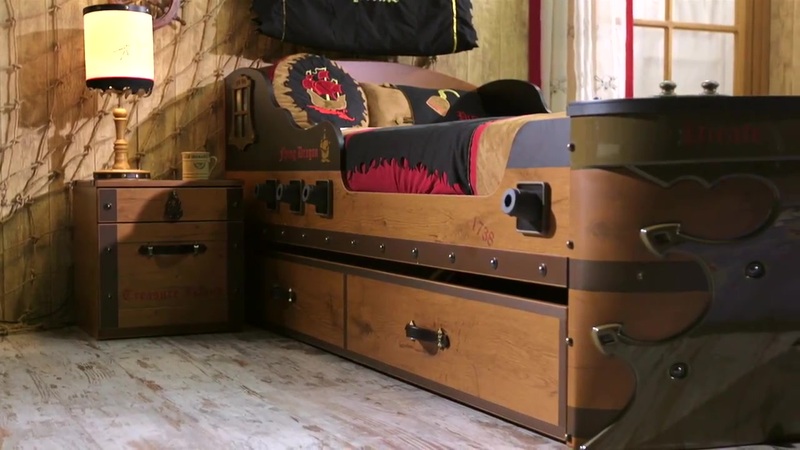 Sail the seven seas in the best ship bed for kidsand store away your booty and plunder in the complete boys pirate room. Createan amazing fantasy room with a variety of pirate-themed room accessoriesincluding a whimsical shark study desk and embossed captain's chair to matchthe pirate bed design. Every Pirate needs to have their own Treasure Chest and this one is specifically designed for qui..
THREE-COLOR STYLE: Red, Navy Blue, and Chestnut woodgrain veneers combine to create that authentic ..
Shark study desk makes sure that little "Black Pirates" do not get bored while doing their homewo..
NAUTICAL STYLE: In the shape of a ship’s wheel, this mirror adds a nautical touch to your pirate ca.. The Trundle Storage can be rolled away from the Armada Bed. Features:	• Premium Quality	• High .. This Rug is part of the “Black Pirate” collection. Beautifully crafted by Cilek, this rug can be ..
A true pirate is a good sailor and never loses his course. The pole star is onboard the pirate sh..